Console with a base and structure handcrafted from mahogany, with golden leaf and lacquered in black with a high gloss varnish. Product features: Console with a base and structure handcrafted from mahogany, with golden leaf and lacquered in black with a high gloss varnish. Contains four drawers with polished brass handles. Arts and Techniques: Joinery, Application of Golden Leaf, Turnery and Varnishing. Materials and Finishes: Mahogany, Golden leaf polished brass, High Gloss Varnish. 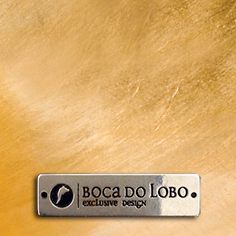 Product Options: Finished in gold leaf, silver leaf or copper leaf. Finished with a high gloss varnish. High gloss colored lacquer in black or white. Clean and Care: Dry cloth and a dry cloth metal cleaner for the handles. Metropolis console raises the level and expands the limits of design with a base of elegant composition and gracious lines. This exquisite table was designed to add a note of distinctive charm to a living room or a wide hall. Its base is handcrafted from mahogany and the top is framed in particleboard, which gives the black high gloss lacquer its texture appearance. There are four drawers with delicate brass handles. Metropolis is a modern console table available in either black or gold.